The cover: This cover was tricky- I thought the cover model was obviously in a bad wig and was a little upset about how fake it looked. I laughed pretty hard at myself while I was reading the story because she is SUPPOSED to look that way- she is wearing a wig in the story! I wanted to say "Well played, cover designer, well played." I love that she is also on the back of the book- which I didn't realize until I started reading. I am a big fan of all of Julie Klassen's covers and this book is no exception. The characters: Margaret Macy is a selfish, callous, and uncaring girl. She is driven by catching the right man to escape from her horrible step father and is willing to do what is necessary to do so. She went through an incredible transformation during the book. I loved Margaret and Nora and the knowledge she gained while she was acting as a maid. I also fell in love with Nathaniel. He was the perfect hero- I loved how strong of character he was and the love that he had for Nora/Margaret. The story: If you are a fan of Downton Abbey- you will adore this book! I loved getting to see the point of view from "below stairs". It isn't often that we get a chance to read books that aren't about the rich and elite. 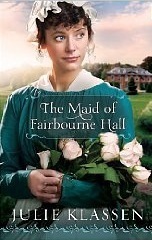 I loved the relationships, the cattiness, and the drama that happened in Fairbourne Hall. I also loved the "Does she know?" "Does he know?" that Nora went through trying to hide herself from the family of Fairbourne Hall. This is not a story to be missed- if you a fan of historical fiction... you will LOVE this story! This sounds like a great read. I love stories like this! Adding it to my tbr list for sure. Sounds like an interesting book. It's nice to have stories about 'normal people' from that era, instead of just the upper class. Seeing you recommend this for lovers of Downton Abbey makes me all the more interested as I love the show and have been on the lookout for readalikes. Thanks for the tip!